Sadhguru answers a question about the purpose of life and explains why having a "god-given" purpose will only restrict life. Questioner: It seems like there are people who know, what he meant to do, and I just don’t get that and I am in this path, where am I? What’s for me the purpose of life, if you can give an insight on that? Thank you. Sadhguru: Isn't it fantastic that if there is no purpose, you have nothing to fulfill, you can just live. No, but you want a purpose and not a simple purpose, you want a "God-given" purpose. It's very dangerous. People who think they have a God-given purpose are doing the cruelest things on the planet. Yes or no? They are doing the most horrible things and they’ve always been doing the most horrible things because when you have a God-given purpose, life here becomes less important than your purpose. No, life is important. Life is important - when I say "life," I am not talking about your family, your work, what you do, what you do not do, your party - I am not talking about that as life. This is life (referring to the self), isn't it? Life is within you or around you? You’re mistaking the ambiance of life for life. Your home, your family, your workspace, your party - this is all ambiance of life. This is not life, isn't it? Yes or no? 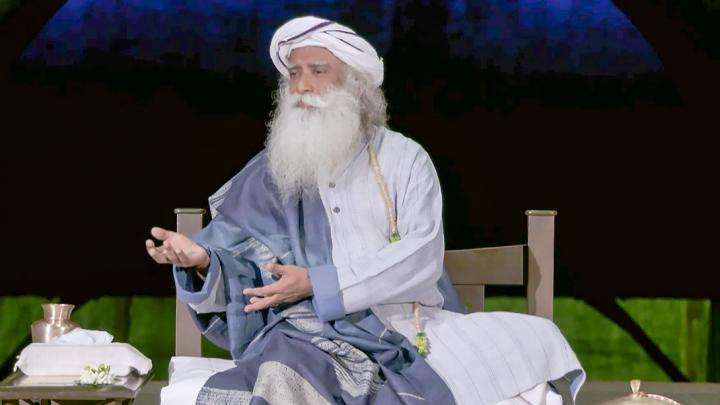 Sadhguru: You’re mistaking the ambiance for the real thing. No. Life is important because it's the only thing you know, you don't know anything else. Do you know something else? Rest is all imagined stuff. The only thing is that this is beating and alive and that's all there is. This is the greatest aspect of life - that it has no meaning to it and there is no need for it to have a meaning. So, is this important? It is of paramount importance. Not you as a person, that’s not important, but you as a piece of life - it’s very important because that is the basis of everything. When I say that is the basis of everything, the universe exists for you only because you are, isn't it? Yes or no? The world exists for you only because you are, otherwise it won't exist in your experience. So, in every way this is important. So, what is the purpose for this? See, if you had a purpose and if you’ve fulfilled it, after that what would you do? Bored, isn't it? It is just that life is so intricate and so phenomenally intricate that if you spend a 10,000 years looking at it carefully, you still will not know it entirely. If you spend a million years looking at it with absolute focus, still you will not know it in its entirety. That’s how it is. Is there a meaning to it? The greatest thing about life is that there is no meaning to it. This is the greatest aspect of life - that it has no meaning to it and there is no need for it to have a meaning. It is the pettiness of one’s mind that it’ll seek a meaning because psychologically you will feel kind of unconnected with life if you don’t have a purpose and a meaning. People are constantly trying to create these false purposes. Now, they were quite fine and happy. Suddenly, they got married. Now the purpose is the other person. Then they have children. Now they become miserable with each other. Now the whole purpose that I go through all this misery is because the children. Like this, it goes on. These are things that you’re causing and holding these as purposes of life and is there a God-given purpose? What if God does not know you exist? No, I am just asking, by chance. I am saying in this huge cosmos, for which God is supposed to be the Creator and the manager of these hundred billion galaxies, in that this tiny little planet and you in Houston, Tch… Suppose he doesn’t know that you exist, what to do? Possible or no? I am sorry, I am saying such sacrilegious things but is it possible or no? What if he doesn’t know that you exist? The need for purpose has come because you’re trapped in your psychological structure, not in your life process. What if he doesn’t have a plan for you? Like Obama care. Suppose, he doesn’t have an individual plan for you! Don’t look for such things. The thing is, the creation is made in such a way that Creation and Creator cannot be separated. Here you are a piece of creation. At the same time, the source of creation is throbbing within you. If you pay little attention to this process of life, you would not need any purpose. It’ll keep you engaged for a million years if you want. There is so much happening - so much means so much unbelievable things are happening right here. If you pay enough attention, a million years of existence, it will keep you busy or more. Right now, the need for purpose has come because you’re trapped in your psychological structure, not in your life process. Your psychological structure functions from the limited data that it has gathered. Within that it rolls and right now, your thought and emotion has become far more important than your life. So, because of this you’re seeking a purpose as an escape from the trap that you have set for yourself. It is a trap set by you. You can easily come out of it. If the trap was set for you by somebody else, difficult to come out because they’ll set the trap in such a way that you cannot come out. I am talking about life not marriage, that’s what I mean. So this is a trap set by you. This is easy to come out, but that is the whole thing. Why it is so difficult is, now you’re identified with the trap, you like it. You like it because it gives you a certain sense of safety and security and protection and individual identity. If you build a cocoon around yourself, it gives you safety, but it also imprisons you. Walls of self-preservation are also walls of self-imprisonment. When it protects you, you like it. When it restricts you, you do not like it. That is why we have doors. We like the walls because it's protecting us, but we have doors so that we can open it and get out when we want to. It doesn’t matter how nice it is, we still want to go out, isn't it? Those who find a purpose in their life, they become so conceited. They will live within their own trap forever thinking that they’re doing the most fantastic thing. So that is how it is with every trap that you set. It doesn’t matter how nice it is, you still want to go out. So, the psychological wall that you’ve built, which gives you some sense of identity, which gives you some sense of being an individual person and which gives you security, beginning to experience it like a trap; somewhere you want to break it. So, one way of not breaking it is to find a purpose. Those who find a purpose in their life, they become so conceited. They will live within their own trap forever thinking that they’re doing the most fantastic thing. And now you said I’ve found a purpose. No, I am just fooling around, really! This is not a mission. People think I am some kind of a missionary because of the energy with which I am going at it. I am not going at it with any zeal, but I am going at it with a certain energy because it's normal for me to involve myself like this in anything for that matter. You know like last two months have been a blitz of activity; blitz means like without a day’s break, without an hour’s break it's been going on like over twenty hours a day nonstop. So, I was in London, I did a three-day event, then I went straight from there to Kumbh. From there all of us who went there caught a flu, but then I went straight to Hyderabad, that afternoon I flew and in the evening I started a program - three-day event. All of them went down who traveled with me, but with my flu I taught three days’ program. Then I came into the ashram and then samyama started that evening, eight days of samyama which is an intense process. The day samyama closed, we started the Yaksha program and the Inner Way program. The day that closed, we had the Mahashivaratri, then Brahmachari meet and teachers’ meet - going on like this. My busy day means I am sitting twelve to fourteen hours in the same place unmoving. Everybody goes to the bathroom, but I don’t. So, I thought I need to move a little bit and I said, ‘Let's go golfing.’ So, we went into a mountain place close by and I went with three other people who traveled from somewhere else and came. In two-and-a-half days I did eighty-five holes in the mountains. They all came in turns, but I went all the way. Every round that you do you walk, no buggies and all that stuff, walking. Ten kilometers you walk in the mountains at 6300 feet, eighty-five holes in two-and-a-half days. It is wonderful to exist here without any purpose. It takes a certain freedom from your psychological structure to be here without any purpose. So, if I go like this. Is golf a purpose of my life? No. I approach everything with a certain energy. This does not mean I found a purpose in hitting a ball. Similarly, I am teaching Inner Engineering because I find it's useful for the people. If I see a little boredom in anybody’s face, maybe I won't teach after that. Because I still see people are eager and anxious wanting to know something, I am on. If I see people around me are bored, then maybe you’ll never see me teaching again, because I am not seeing teaching Inner Engineering as a purpose. Right now, I see it is needed. So, it’s difficult for you to understand probably right now, but the things that I throw my life into, are things that don’t mean anything to me, really! You think Isha Foundation means a world to me? No. Right now, I see without a foundation, we cannot function. With great reluctance, I formed the organization. Now it's grown, grown beyond what most people understand - it's grown very big. Is it the apple of my eye? No. I don’t like apple in my eye, I like my eyes clear. I keep it clear of all apples. You know the last time somebody got into the apple trouble, what happened to them. So, I am saying I am throwing myself at something with great passion. This does not mean that is the purpose of my life. It is wonderful to exist here without any purpose. It takes a certain freedom from your psychological structure to be here without any purpose. If you’re trapped in your psychological structure you need a purpose. Otherwise, your psychological structure will lose its integrity. That’s why the girl who was asking at that time, I said, “First thing you need is balance. If you have balance, then you can climb. If you don’t have balance, it's better you stay on the ground.” It's not safe for somebody who is not balanced to climb high. It's best you stay close to the ground. You should not climb. So, first thing is to establish a balance, then you loosen your psychological structure, then it's a wonderful thing. If you are loosening your psychological structure without balance, which lot of people are doing today. See, why does somebody want to drink alcohol or take a drug? Because it loosens your psychological structure and makes you feel liberated for a moment but without the necessary balance. You have not worked for the balance, but you got freedom. Freedom without balance is destruction, anarchy, isn't it? The purpose of life is to live and to live totally. To live totally means - before you fall dead, every aspect of life has been explored, nothing has been left unexplored. So, first thing is to work for balance, an enormous sense of balance where even if you dismantle your psychological structure, you can simply live here. Dismantling your psychological structure is an important process because that is your trap, that is your security, that is your stability. At the same time, that’s your trap. Because the walls are set, you feel secured, but that’s also your trap. If you dismantle your trap, you also dismantle your security, isn't it? You also dismantle your sense of purpose. You also dismantle everything that matters to you. So, that will need balance. Without balance, if you dismantle you’ll go crazy. But, don’t look for a purpose because if you look for a purpose, you are seeking madness. If you find one, you are sure mad. Yes. If you think you’ve found a purpose in life you’re for sure gone crazy because only the insane people have purpose or people who have a purpose are insane in many ways. These are things that you create in your mind and believe it's true, isn't it? Right now, ‘fighting for my country is my purpose.’ Right now if it's necessary, I’ll fight knowing fully well it's an unnecessary bloody fight. Yes. Then you’ll fight only to the extent it's necessary. If you think this is your purpose, you would want to destroy the whole world for what nonsense you believe in, isn't it? If something is needed, we will do it with absolute involvement. Tomorrow suppose I find all of you are enlightened, it may happen! Suppose I find all of you are enlightened, will I come here and say “See, what did you have? Maggi noodles? Your body, you accumulated. You are not the body, you are not the mind,” it would be irrelevant, isn't it? Yes or no? So when I see that you are enlightened, I’ll stop Inner Engineering. Right now, it's needed, we’re doing. This doesn’t mean this is the purpose of my life. This is an unfortunate necessity, but I will do it joyfully and with great vigor because I do that with everything, not just with this. Don’t think I only teach the program with intensity and vigor, I live my life like that with everything, I eat like that also. I will do everything with intensity and vigor, that’s how you’re supposed do your life, isn't it? So, please do it that way. There’s no other purpose. The purpose of life is to live and to live totally. To live totally does not mean party every night. To live totally means - before you fall dead, every aspect of life has been explored, nothing has been left unexplored. Before you fall dead, even if you do not explore the cosmos, at least this piece of life (Referring to oneself) you must know it in its entirety. That much you must do to yourself, isn't it? That’s living totally, that you experience the whole of this, all dimensions of what this is. You did not live anything untouched. You just do that. That will take a long time. That’s good enough purpose for you. Sadhguru delves into the matter of destiny and fate, saying that it is just a choice between compulsiveness and consciousness. 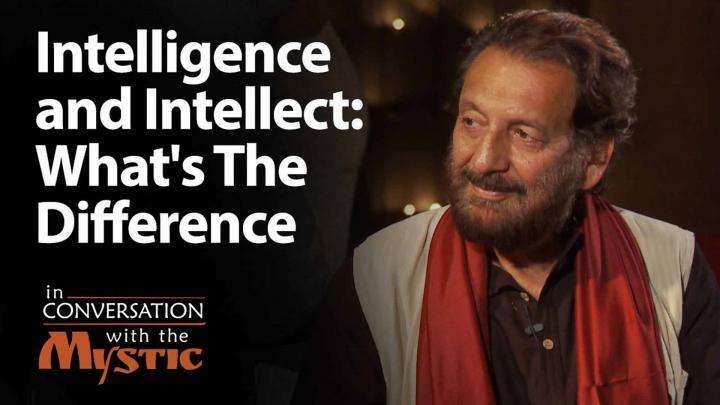 Sadhguru looks at how a human being is capable of employing intelligence, without the intellect.